Yesterday, we faced the fact that the Christian life is filled with disappointment, suffering, and sacrifice. Abraham and countless other saints with him never actually lived long enough to see the fulfillment of God’s promises, so that they lived their entire lives as strangers and exiles, “looking forward to the city that has foundations, whose designer and builder is God” (Heb. 11:10). C. S. Lewis wrote frequently of the desire that eventually drew him toward faith in Christ. He called alternately “Longing,” “Sehnsucht” (the German word for longing), or, mostly, “Joy.” This Joy crept up at key points in his life even before he became a believer, where he sensed a profound desire for something beyond his grasp, something otherworldly. But, he realized that he had begun to desire this Joy itself, because it whetted his appetite for something beyond the fleeting pleasures and joys of this world. The Joy began to break down his atheism to a basic belief in God that rejected Christ; and then finally, the Joy broke down his rejection of Christ altogether. To paraphrase Lewis a bit, our longing for a better country does not necessarily prove that we will inherit that country. We may, in fact, fall short of the glory that we seek in the last analysis. But, the fact that we long for the better country is strong proof that such a country exists, and even that some people do inherit it. And this Joy is the “desire” for a better country that the author of Hebrews mentions in chapter 11. Through this longing for something better, God moves us to leave behind our comfort, our ease, and our prosperity in order to go to the place he shows us. Like Abraham, God trains our hearts through a taste of the world to come so that we are quite willing to move beyond the sacrifices inherent in the call to follow Jesus. In fact, we cannot follow God by faith unless we desire to gain what God offers us. If our desires are satisfied by the trifling pleasures of this world–if we never find ourselves longing for a better country–then we will never be willing to act. We will never leave Ur of the Chaldees to move to Canaan, and we will never content ourselves to live in tents as we seek the city with foundations, whose designer and builder is God. Desire precedes action in our lives. This means that the our spiritual formation revolves around cultivating desire–specifically, desire for God. 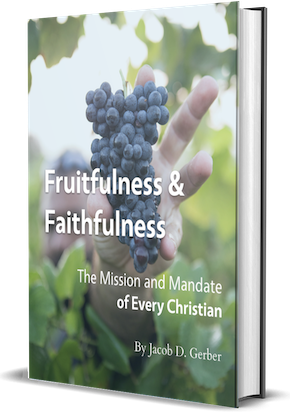 Now, cultivating desire is a deep spiritual work that God alone can accomplish; however, God accomplishes this work in us through teaching us to hunger for the means of grace that he has ordained. God uses our current prayer lives to deepen our desire to pray. God uses our study of Scripture to give us a greater love, and consequently, a greater desire to continue studying the Scriptures. Do we neglect reading the word in order to pursue other activities (thereby cultivating a love for those things above God’s word)? Do we fail to pray, choosing rather to fill our minds with a constant barrage of television, radio, books, magazines, or other media (thereby cultivating an inability to pray and a constant desire for stimulation)? As an illustration, I have always hated exercising. The few occasions where I would drag myself to giving exercise a shot, I felt awful, and so I didn’t keep with it, further cultivating a dislike of exercising. But for the last couple of months, I have been running with a good deal of consistency. Not only am I getting rid of old desires not to exercise, I am also cultivating a desire to exercise where I feel fat and sluggish if I don’t exercise like I am supposed to. So, by the grace of God, what kind of desires are you cultivating by your day-in, day-out activities? Are you cultivating an ever-increasing love of God, or are you cultivating an impulse never to get to close to God, but instead to cultivate your desire in all the things of this world? Brothers and sisters, longing for a better country, that is, a heavenly one is a big deal. Because of such a desire, God is not ashamed to be called our God, for he has prepared for us a city. May God grant us the desires for his heavenly country that will prompt us to obey his call by faith in the promises that he holds out to us.